The Short Perfecto in this line is one of my all-time favorite cigars. So, I couldn’t help but approach the larger Aniversario No. 3 with a bit of trepidation. Would this version—a 6-inch, 50-ring gauge toro—have the same pleasing impact? I’ve smoked a few of the other Colorado Claro vitolas in addition to the Short Perfecto. But with this box of the Aniversario No. 3, it’s the first time I’ve been able to evaluate one on a consistent basis. Davidoff first released the Colorado Claro in the early 2000s, then brought it back in 2009. It’s something of a spinoff of the Special Series, with its own lovely Ecuadorian Connecticut wrapper that Davidoff describes as “a very rare wrapper that makes all the difference in taste.” The binder and filler are from the Dominican Republic, where the cigars are rolled. Retail price for the Aniversario No. 3 is about $25, and the toro comes packaged in boxes of ten. There are currently five vitolas in the line. 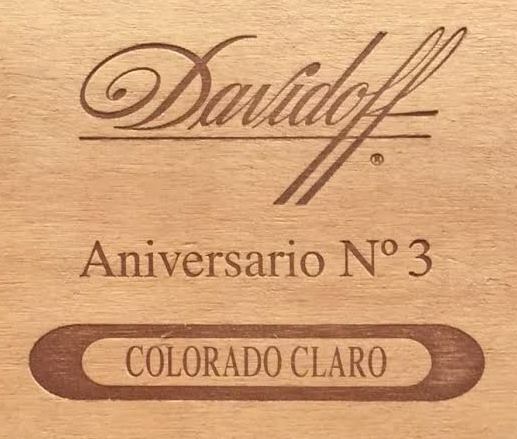 With the many new Davidoff productions in recent years, such as the Winston Churchill, Yamasá, and the soon-to-be-gone Puro d’Oro, the Colorado Claro’s strength no longer stands out as it once did. What does stand out, however, is the fine balance among the flavors. The cigar begins with a delicate mix of tobacco sweetness and pepper, which holds on through the finish. Along the way, I also found nuts, wood, a bit of coffee, and the occasional note of that typical Davidoff mustiness. As expected from Davidoff, the basics are first-class: construction, burn, smoke production, and draw were excellent in each of those I smoked. All in all, it is an excellent cigar, one with the complexity and strength to please a seasoned smoker while remaining accessible to a newcomer. For myself, I would rate the Aniversario No. 3 just a shade below the Short Perfecto. I believe that compact size and shape combine for a little more punch that sets it apart. Remember, though, I’m talking only a matter of degrees. And none of that should detract from the Aniversario No. 3. It’s an extraordinary cigar that I rate four and a half stogies out of five. I’ve always enjoyed Davidoffs, but have never had one that justified its price to me. I don’t think a Cuban is inherently better, but at Davidoffs are close in price to many Cubans, even in high-tax countries such as Canada.